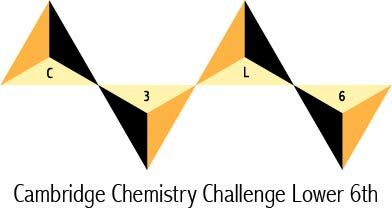 This competition aims to stretch and challenge students interested in chemistry, and will provide an excellent experience for anyone considering taking their studies further. Set by an experienced team of teachers and university chemists, it is designed to be accessible to Year 12 students but will take them significantly beyond the syllabus and encourage them to think about science in the way they would at university. Past papers will provide a valuable resource for teachers. This competition is open to students studying in the UK in Year 12 (Lower 6th) or below. It will take the form of a 90 minute written paper which students will take at school. Details for registering for the competition may be found here and specimen questions are available here. Students who do well in the competition will be sent certificates of achievement, and those who perform best will win an invitation to a residential camp at the University of Cambridge at the end of August. The written paper will be sent to registered schools at the beginning of June. It will consist of two or three questions, to be answered in one 90 minute sitting under supervised conditions. The paper can be taken any time between June 12-21 (after the end of AS exams). The mark scheme will be available from June 21. Teachers may enter as many candidates as they wish. For schools submitting more than five scripts, these should be marked by the teacher; if they enter five or fewer scripts, they may submit the papers unmarked. Teachers should complete the online list of names of candidates who attempted the paper, together with their marks if known. Scripts of students scoring over 50% should be sent to Cambridge by June 27.